Pro-M Racing has been in the engine management business for over 12 years. Three years ago Pro-M Racing released the new Pro-M EFI management system. Since its launch there have been many free upgrades and additions to the system. Earlier this year Pro-M Racing released the Chevrolet LS EFI System, progressive methanol control, and the progressive nitrous controls. 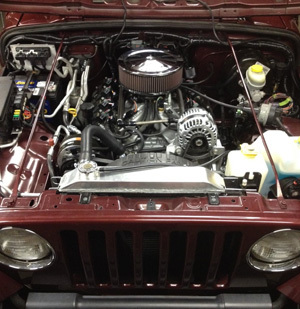 Pro-M Racing is now releasing the Jeep TJ V8 conversion engine management system. The Pro-M EFI Jeep TJ V8 conversion system is an OEM level mass air, sequential port electronic fuel injection system with full ignition control. No other aftermarket EFI system compares, as Pro-M Racing offers the only EFI system to utilize ODB II diagnostics, just like the OEM’s. “While we have had systems for many engines for some time now, the Jeep TJ V8 conversion system was an area where there has been a huge demand. Now Jeep TJ owners can have everything they want, a jeep, V8 engine and an ODBII management system. Our customers will be pleased to see how much easier the Pro-M EFI system is to use than the other offerings out there, and just how well your engine can run with an OEM level management system," said Chris Richards, Pro-M Racing President. The Pro-M EFI Jeep V8 conversion engine management system comes with a completely assembled engine management harness. Many harness configurations are available. The harness will be custom fit for the TJ chassis and the engine of your choice. This Jeep TJ EFI System marks another innovative product release by Pro-M Racing. Since the Pro-M EFI systems use Load calculations to determine the Air/Fuel ratio and Spark Advance, the combination of engine parts simply does not matter. The system will be properly tuned when you receive it! Richards explains that despite the fact that no tuning is required, the Pro-M EFI Jeep V8 conversion management system is fully programmable. The customer can decide how much programming, if any, they want to do! Imagine a Jeep Management System that uses load based fuel and spark calculations, which means no tuning required. To learn more about the Pro-M EFI system and other products of Pro-M Racing, please go to promracing.com.